Ukrainian fighter Igor Subora sees his upcoming three-round encounter with Sherif “The Shark” Mohamed as an opportunity to bring back the luster of his professional mixed martial arts (MMA) career. Both highly-decorated combatants are set to collide on the undercard of ONE: QUEST FOR POWER, which takes place at the Jakarta Convention Center in Jakarta, Indonesia on 14 January. Subora is one of the few foreign nationals who opted to make a run for the money and compete professionally in the Philippines. 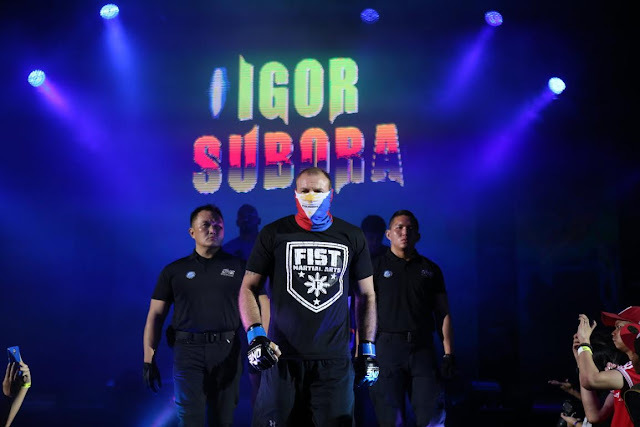 Although he acquired his Combat Sambo pedigree overseas, Subora decided to train as an MMA competitor when he migrated to the country in 2008, honing his skills in neighboring gyms around Metro Manila. Subora remarkably conquered the local MMA scene in the Philippines, attaining four first-round knockouts and one submission victory. In addition, Subora captured a local MMA promotion’s heavyweight championship belt by way of a 49-second knockout in 2011 and reigned for three years with ease. His success in the Philippine MMA circuit led him to be noticed by ONE Championship, which is widely regarded as the largest MMA organization in the Asia region. Despite his triumphant run in the local ranks, he struggled to translate it in his first two ONE Championship assignments. Subora yielded to future ONE Heavyweight World Champion Brandon Vera in his December 2014 promotional debut before suffering the same fate at the hands of Cameroonian brute Alain Ngalani in November 2015. The 36-year-old Ukrainian stalwart stressed that is determined to break his losing spell inside the ONE Championship cage and regain his reputation as one of the top-notch MMA competitors in Asia. “I am very focused, motivated and doing everything right this time around to get the win. It’s my chance to redeem myself. I can tell everybody that my hand will be raised this January 14,” he stated. The man standing in Subora's re-entry to the winner's column is the debuting Mohamed, a well-versed kickboxer and wrestler who has eight of his wins coming by finish. Of his total victories, Mohamed owns four submission wins and four knockout wins, proving his versatility and well-rounded fight game. “My opponent had great wins in the past, but I don’t know if he is ready for what I am bringing on fight night. I consider myself as the experienced fighter in this match-up,” Subora said. “I fought the best in the Philippines and in ONE Championship. I don’t think he is ready to play with the big boys,” he added. Subora knows that he has a tough task ahead of him, but he remains optimistic that he will walk away with the victory. “I am hungry to win this fight. I learned a valuable lesson from my last two fights. I am very excited to get back. I feel like I haven’t shown my true from in ONE Championship. This will be a great platform to show the world the real Igor Subora,” he ended.